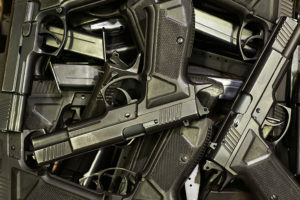 Racketeering Indictment Charges Alleged Leader of Major Camden Gun Trafficking Ring, His Ohio Purchaser, and Five Middlemen Who Allegedly Brokered Illegal Sales of Guns – Including Assault Rifles – To Criminals. AG’s Office, NJ State Police, DEA Camden HIDTA Task Force, Camden Metro PD & ATF break up ring. (Trenton) Attorney General Gurbir S. Grewal today announced that a state grand jury has returned an indictment charging seven members of a major gun trafficking ring in Camden with first-degree racketeering, including the alleged leader of the ring, his “straw purchaser” in Ohio, and five middlemen who allegedly brokered black market sales of guns – including assault rifles – to criminals in the city.